Provenance: ……….Sir Hugh Sealy, Bart, Brook House, Isle of Wight. His sale, Christies 16th May 1930 (lot 57) as “Potter” (= Paulus Potter (!)) “A river scene with cattle on the bank and figures bathing"
Engraved: Thomas Milton “Select views from the seats of the nobility and gentry in the Kingdom of Ireland” (1793) plate XVI, engraved and dedicated to Samuel Hayes. Wheatley seems to have been incompetent with money, and was frequently in debt, despite numerous commissions. He moved from London to Dublin to escape his debtors (and a cuckolded irate husband: he was accompanied by) from 1779 to 1783, and painted numerous highly accomplished paintings whilst there. His masterpiece of these years is the remarkable The Irish House of Commons, 1780, now in the City Art Gallery, Leeds, which depicts a vast series of faithful portraits of all the Members of Parliament in Dublin. Wheatley was at the height of his powers during his years in Ireland, and the types of painting he undertook were numerous. The present picture is one of a series of delightful and fresh topographical landscapes which were later engraved by Thomas Milton for his book of Irish views (see above); another example, from the collection of the Knight of Glin, was recently sold at Christies (7th May 2009: see below). Wheatley was a versatile painter, executing straightforward portraits, conversation pieces, domestic and sentimental genre paintings and theatrical illustrations. 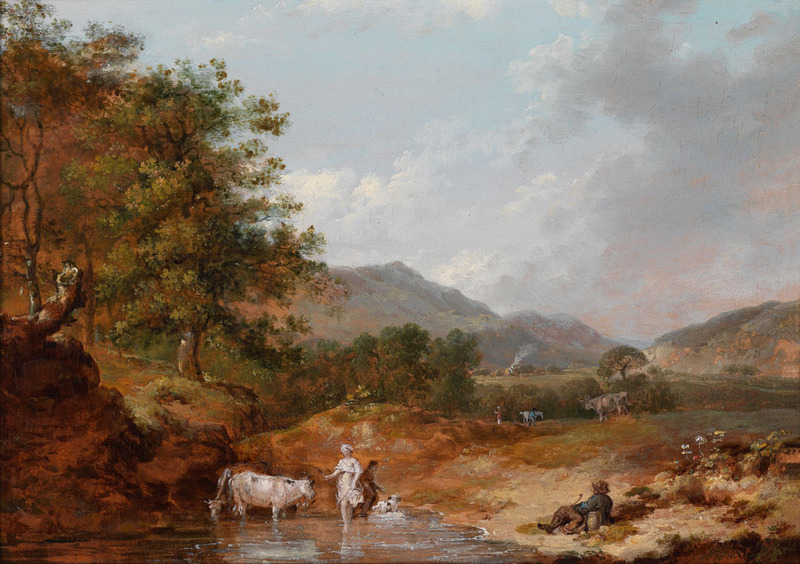 He seems to have taken a particular interest in the depiction of rural life from the 1780’s onwards, and executed such pictures as “The Industrious Cottager”; “The return from Market”; “The return from Shooting”; “Haymaking: a view near a wood”; “The Harvest Home”; “A Harvest Dinner” and “Evening, a Farmyard”. “Wheatley’s life is strictly that of a hard working professional artist……….” (Webster, p.113). “He was a handsome man, of elegant manners, and generally a favourite in genteel company. He understood his art, and spoke with taste and precision on every branch of it” (A Chalmers, Biographical Dictionary, 1817). He was “A very personable man, fond of dress, and polite in his manners, which makes him a great favourite with thehe Napoleonic Wars, and the consequent collapse in demand for art, added to his financial problems, and he was ultimately forced into the Debtors’ Prison of The King’s Bench. By the time of his death at the age of 54, he was an emaciated and wasted figure, incapable of caring for his wife and family of four children. His widow was granted a pension by the Academists until her own demise.